Texas boasts many claims to fame, from Willie Nelson to “Keepin’ Austin Weird.” However, Texas has one other huge claim to fame: weather changes violently, suddenly, and without reason in Texas, and you could find yourself driving through a living, swirling, hail-laden version of hell one day. Unfortunately, Texas weather causes wrecks, dings, dents, slips, bumps, broken mirrors, shattered windshields, blinding fog, icy roads, and even blizzard-like conditions. However, a defensive driving Texas course help you prepare for these problems. Texas highways and roads are the arteries of the state. Without our infrastructure, we would not be able to expand our horizons or access our huge oil deposits. Therein, lies the other problem of Texas: oil drips from tankers, vehicles and machinery onto the roads. As the oil dries, it leaves behind a slippery residue. When it rains or the road becomes wet, the oil becomes a slick mess trying to cause a wreck. In our defensive driving Texas course, you will learn how to reduce your chances of having a collision or sliding off the road following long-periods of little precipitation. Recall the nightmarish images of tornadoes and massive flooding across the state in May 2015? Taking a defensive driving course could have saved the lives of those trapped in rising floodwaters. Defensive driving is not just about watching your own actions; it’s about watching the actions of your environment and reacting appropriately. If you can see the hail hitting the car and the windshield wipers are keeping it at bay, you are fine to continue driving. As rainfall becomes heavier, the size of the hail-stones tends to also rise. Park under an awning or parking garage. Many try to park under overpasses, but this is very dangerous in busy areas. 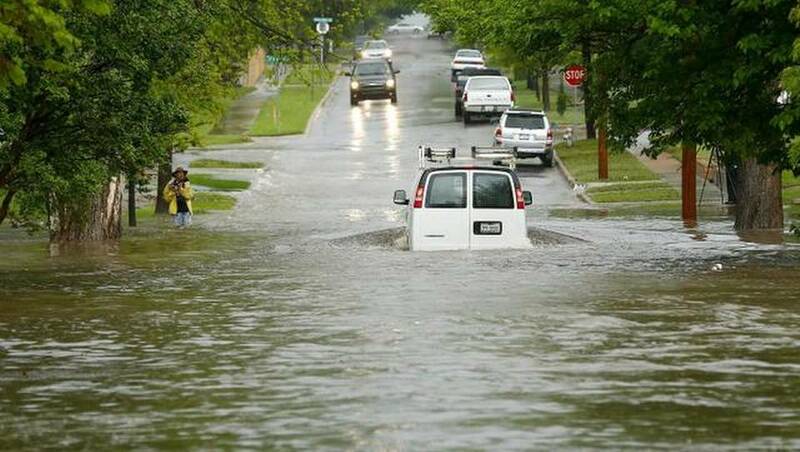 Beware of flash flooding that may occur when the hail and rain become more rapid. Vehicles, cars and trucks included, are not safe in a tornadic storm. Even if the storm is a few miles away, the winds can quickly rise up beyond 100-mph. Do not attempt to outrun a tornado. You’re best bet will be to find a low-lying area or storm shelter. Across Texas, many rest stops have tornado shelters built-in. If you are planning a trip across the state, review the Department of Transportation’s Safety Rest Stop listings prior to leaving. This will help you know where you can stop if you encounter a tornadic storm. Always, listen to the local radio stations if the weather appears to be getting bad. Sirius XM, Pandora, and your iPod will not have updated, recent weather reports or warnings for your area. In Texas, you can get insurance discounts, have a ticket removed from your record, and pay less for fines if you have taken an accredited defensive driving Texas course. Moreover, defensive driving teaches you to drive in the major cities, where common driving practices seem obsolete. For example, the speed limit on I-30 may say 75, but people are driving up to 95 mph. You will learn how to react in these situations to ensure your safety and the safety of the drivers nearest to you, such as decreasing following distance and being courteous to other drivers. Every time you enter the car, you take your life into your own hands. Driving is one of the few activities that could kill you if done incorrectly, and you need to have the best driving education possible. Whether you need help improving your driving skills or navigating the hellish hail terrain, defensive driving Texas will be there to help you. You’re the driver; own your responsibility.